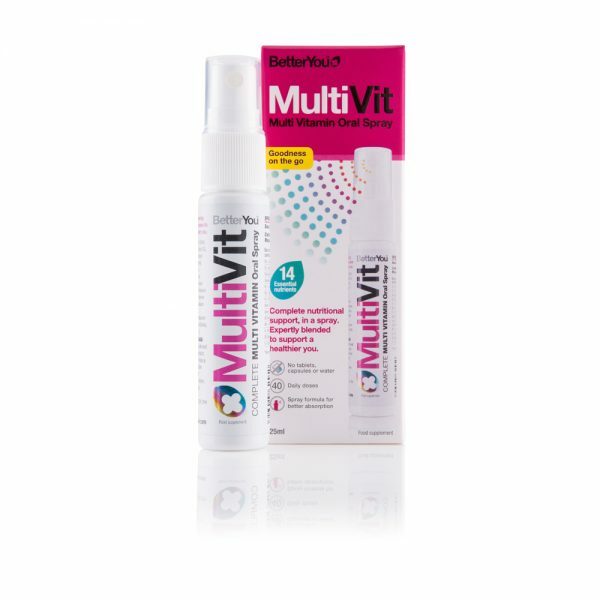 BetterYouTM MultiVit Oral Spray is a pioneering product combining 14 essential nutrients with convenience and optimal absorption. The robust multi-nutrient formulation containing the full spectrum of vital B vitamins including folic acid, vitamins A, C, D, K and key minerals. Designed to give our bodies the vitamins many of us miss out on due to busy lifestyles, poor diets and the reduced nutrient quality in highly processed foods. The spray is micro emulsified, controlling droplet size for fast and effective absorption within the mouth. A superior alternative to traditional tablet supplementation. BetterYouTM MultiVit is suitable for those on a vegetarian, coeliac or diabetic diet.